As the horror genre has evolved over the years, movies and video games are relying less on jump scare tactics and utilising more psychological horror elements. A subgenre of psychological horror is Lovecraftian horror – a premise based upon the works of author H.P. Lovecraft that deals with themes such as fear of the unknown, helplessness, loss of sanity and more. Lovecraft’s works, such as Call of Cthulhu, didn’t gain substantial popularity until after his death in 1937 and they are now a popular source of inspiration for all kinds of projects. 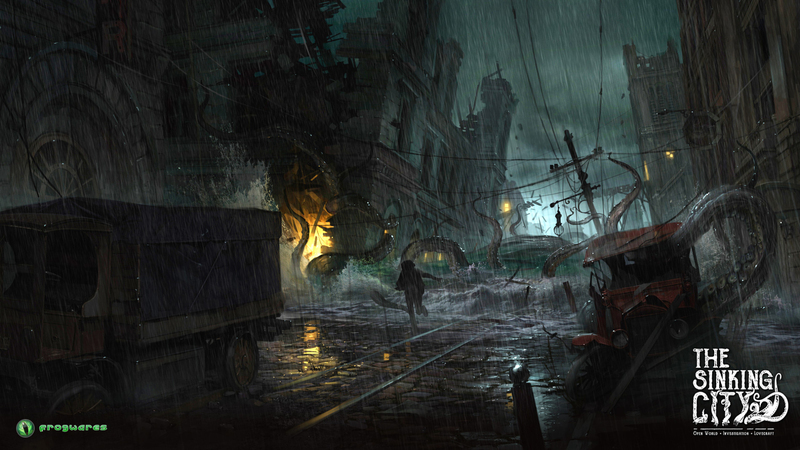 One game harnessing the themes of Lovecraft is The Sinking City, which is currently being developed by the Ukraine-based studio Frogwares, a team known for its work on the Sherlock Holmes series. We caught up with Frogwares’ community manager, Sergey Oganesyan, to find out all about The Sinking City and how it will give players a unique Lovecraftian experience. WP: Thank you for taking the time to speak to us about your upcoming game The Sinking City. SO: Hey, thank you for giving me the opportunity to talk about it! WP: In your own words, what is The Sinking City all about? 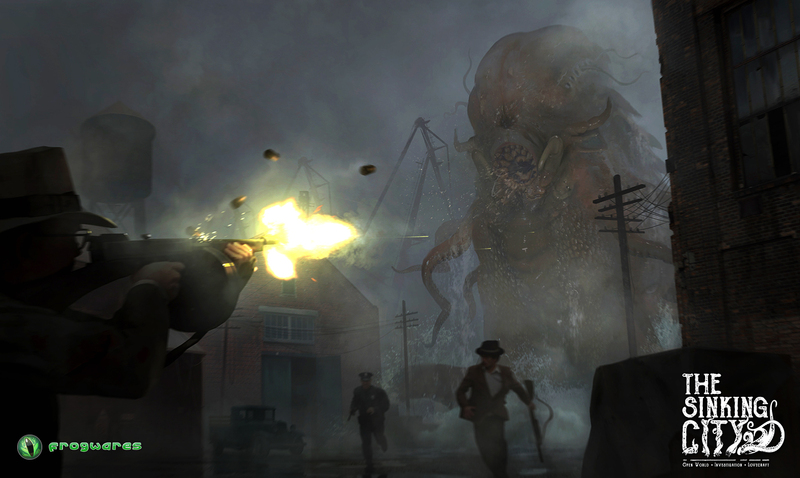 The Sinking City is a third person action investigation game, heavily inspired by H.P Lovecraft and is set in his universe. The game tells a story of a 1920s private detective, who arrives in the fictional city of Oakmont, Massachusetts, to find it in total disarray and chaos. Locals are trying to survive a brutal flood, which at first looks like a natural disaster. But as the flood is not withdrawing and the city inhabitants are slowly sinking into insanity we feel that some supernatural power is at play. Our goal is to solve the mystery of this city which oddly seems to relate to us in a strange way. As a detective, we will be using our wits and intuition to conduct investigations, examine crime scenes, question suspects and deliver justice (or injustice, based on your moral compass☺) to those we consider responsible for something. And when push comes to shove, our hero can rely on his weaponry to try (try!) and keep himself out of harm’s way. WP: As a big fan of H.P. Lovecraft’s work I am excited to see your take on his universe. Are the majority of the development team fans of his work? You bet! Most people in our company have read his works, and have a strong opinion on them. Our narration team, for example, really dig his underlying themes, such as fear of the unknown, fatalism, our place in the universe, the futility of our efforts, insanity, and, of course, cosmic fear. Btw, we’ve actually made games in the past that featured the Cthulhu Mythos, like Sherlock Holmes The Awakened in 2007. This should tell you we have been fond Lovecraft for a long time, and The Sinking City is not something we decided to make out of the blue. WP: You’ve explained in a dev diary video that your adaptation is more of an expansion of Lovecraft’s works as opposed to a rendition of a particular story. How beneficial has this freedom been? You are absolutely right, The Sinking City is an expansion of the Lovecraft universe. What does that mean? It means we totally recognize events that happened in his novels, they are canon in our game as well. Characters of Lovecraft and his followers created also exist in our world. That doesn’t mean they all will be present in The Sinking City though. I mean, some will be, like hybrids who moved to Oakmont from Innsmouth. Of course, certain INCOMPREHENSIBLE and ancient beings are also part of the game. But what we ultimately want to do is use the foundation – the underlying themes I mentioned above – to tell our own story. This allows us to build our own world, create our own characters, write their own motivations etc. Our hands are untied because a lot of what we do is basically based on our interpretation of Lovecraft’s works. On the one hand, this freedom is great for us for obvious reasons. On the other hand, we must make sure what we create actually fits the Lovecraftian world. WP: You mentioned that The Sinking City is set in the fictional city of Oakmont. Was Oakmont inspired by any real cities? SO: Yeah, by Boston and a lot of other cities in Massachusetts and New England. We obviously want it to feel and look like something that could exist in the U.S. in the 1920s. We have seven districts in Oakmont, each conveys different atmosphere and mood, based on lighting, architecture and a ton of different factors. So each of this districts was created to be pretty unique, in accordance with its history and lore. Our city unit designed how the city was founded and how it was developed over time. This means different areas of the city were shaped under the influence of the architectural styles that dominated at the time. Early colonialism, federal etc. WP: The game is set during the 1920s. How much research went into ensuring the setting is accurate as possible whilst maintaining the Lovecraftian atmosphere? SO: Hell of a lot. We looked at dozens of different cities, both real and fictional. We went to Boston to see if we can capture that New England-ish look and feel and implement it in Oakmont. We brought home hundreds of photos of different buildings, streets, back alleys etc. You know, it’s not just architecture that makes the city, it’s urban planning and city grid as well. Our architect, concept and environment artists have browsed I don’t know how many references online and in literature… It’s crazy. A city is an ecosystem that should make sense, so when you know there is a street you know why it’s there. That’s what we want to do. For example, our city was founded in one area, Salvation Harbor, and then it spread eastward and northward. We have a few buildings Oakmont was built around, like the university. When it comes to the Lovecraft in it, we obviously examined places like Arkham, Innsmouth etc. We needed to understand what makes them unique not only in terms of visual distinction, but also urban planning. We are creating a place where cults can operate, where decay and desolation play their own role. It’s a tricky thing, especially when you consider that the city should mix the Roaring Twenties and Lovecraftian components, and also fit gameplay rules. Not an easy task at all. WP: The number of mediums using Lovecraftian themes has increased in recent years. In your opinion, what makes it such a good foundation to build a game around? SO: In the past decade, there haven’t been a lot of popular video games that explored these themes. Whenever I talk about that with fans, they always mention one game, Call Of Cthulhu Dark Corners of the Earth. In recent years, the situation has somewhat changed indeed. We have Bloodborne, we have other video games that incorporate Lovecraft in certain ways – Darkest Dungeon, Sunless Sea, Amnesia etc. Lovecraftian themes and horrors are not your traditional, well, horrors that mostly rely on gore or jump scares. They are deeply philosophical concepts that leave a lot to imagination and contemplation. I feel like a lot of people out there want to have this psychological depth in their projects. And a lot of people can relate to the concepts that Lovecraft wrote about. It’s a really interesting and fresh setting, not particularly overused. Plus, Cthulhu. What lurks beneath the surface of Oakmont? But what we ultimately want to do is use the foundation (of Lovecraftian horror) – the underlying themes I mentioned above – to tell our own story. This allows us to build our own world, create our own characters, write their own motivations. WP: After spending years working on Sherlock Holmes games what inspired the decision to work on something new? SO: Well, we never want to make the same game twice. Even our Sherlock Holmes games were different from each other in terms of gameplay mechanics and story approach. And after eight Sherlock games, we wanted to do something completely new. We wanted to do open world with side quests, enemies, combat etc. When we started working on the project, we realized we couldn’t do that with Sherlock. That’s how our The Sinking City was born. WP: This is the biggest project Frogwares has ever worked on. How many more resources does a game like The Sinking City require compared to a Sherlock Holmes game? SO: Significantly more. Sherlock Holmes The Devil’s Daughter was our biggest project, it was semi-open world kind of game. But making a full-scale city is something very different. We need more lore, more content, more resources, more story, more everything. Our studio got significantly bigger, with around 80 people working on The Sinking City. And we are still looking for more professionals, animators, environment artists etc. If anybody of your readers are interested, they can find more info at http://frogwares.com/careers. WP: Are you using a new engine for The Sinking City? Or are you sticking with Unreal? If so why? SO: Sticking with Unreal Engine, now version 4 of course. We are more than comfortable with this engine, and we have a lot of experience working with it. We even created our own software in the engine, like City Generator, and other tools that allow us to easily create characters, dialogues and quests for our game. There’s no reason for us to consider something else. WP: Unlike your semi-open world Sherlock Holmes games, The Sinking City is fully open world. How much more challenging has this been from a development point of view? SO: Our semi-open world levels in Devil’s Daughter were created mostly for story and atmosphere, exploration didn’t play a major role in that game. 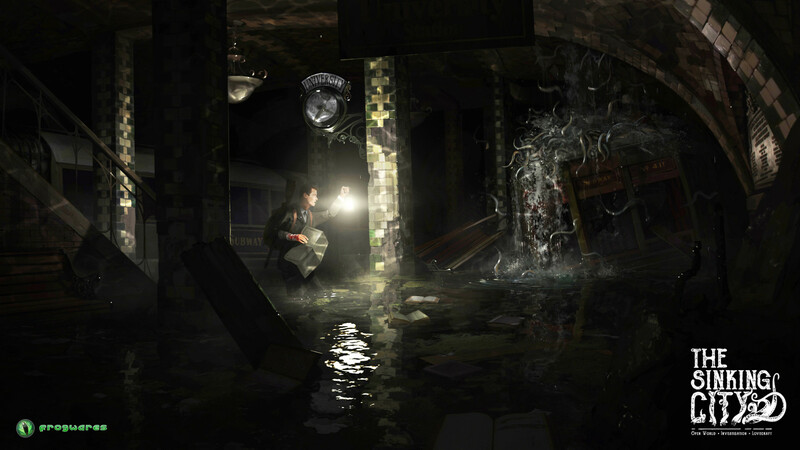 With The Sinking City, exploration is a pillar, a key element. That’s why we need a visually rich and varied city, and it’s not very easy to build it from scratch. Thankfully, we can use the City Generator tool we mentioned. It allows us to avoid tedious manual placement of every building on the map, which otherwise would take I don’t know how much time. But yeah, it’s still a lot of work. After each street is created, we need to go over it, make sure everything is its place, everything makes sense, polish it, add a human touch, add landmarks, create interesting scenarios etc. WP: Sidequests are a common component of open-world games. How challenging is it to make these quests unique and not rely on fetch quests? SO: Well, if our goal was to (artificially) increase playtime, then we would probably add something like that, some filler to keep the player busy. It’s not our goal, though. In our game we have zero fetch quests. We would never ask you to deliver something or collect X items. The Sinking City is not a sandbox game, where the player needs to find ways to entertain themselves. In addition to side quests, the game will offer lots of things for the player to discover. Accidental encounters, interesting situations, danger zones, discoverable lore pieces, collectibles – all that to encourage gamers to explore the world we are creating. WP: How long can we expect it to take to complete everything in The Sinking City? SO: 30 hours for main quests and a big chunk of side quests. Around 50 if you wanna do everything there is in the game. WP: The Sinking City is billed as a story-driven experience. How important and difficult is it to ensure that the story is engaging, but doesn’t stray too far from Lovecraft’s themes? SO: It’s extremely important to have a story that fits Lovecraft’s style and canon. But as I said, we have a lot of freedom with this one, since it’s largely our story. It’s not that difficult to exploit Lovecraft’s themes, since they are sort of philosophically universal and can be applied in different situations. Although, we have a narration team that knows and loves Lovecraft. We’ve studied not only Lovecraft himself, but also writers he himself may have drawn inspiration from, like Edgar Allan Poe. We’ve even read some of his critics, H. P. Lovecraft: Against the World, Against Life by Michel Houellebecq for example. WP: Much like your Sherlock Holmes series, The Sinking City’s lead protagonist, Charles Reed, is a private investigator. How much of Reed’s personality (if any) was shaped around Holmes? SO: Cannot say we are shaping Reed’s personality around Sherlock Holmes, aside from the fact they are both detectives. Reed has his own background, character, motivation etc, his own opinions on things. Also, The Sinking City has RPG elements and we do want to give players the opportunity to roleplay and build their own character to a degree, through dialogue options and moral choices. 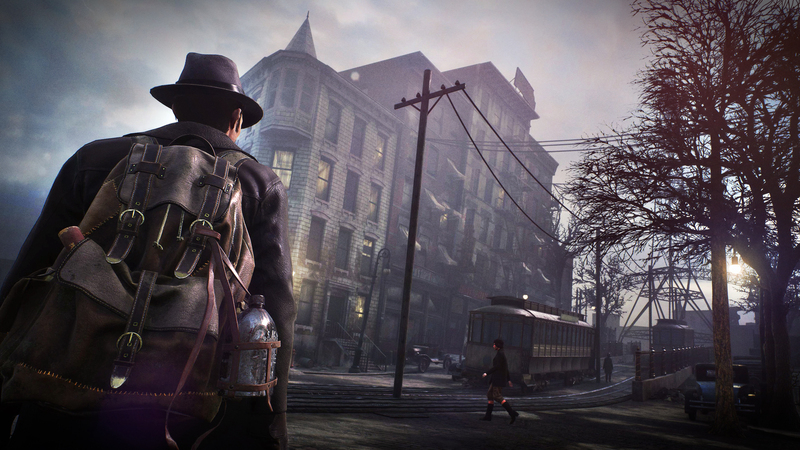 WP: Investigation is a primary part of The Sinking City’s gameplay. How much of this will this borrow from your previous Sherlock Holmes titles? Are you expanding this system at all? SO: So with The Sinking City we are stepping into a completely new territory. While we are using the experience we’ve obtained from Sherlock Holmes games, this is a different game. We have new mechanics, which should work great with our open world and the concept of ‘no hand holding’. We want the player to experiment with their findings and test their intuition. WP: We’ve seen brief glimpses of the game’s combat in action. How much of a role will combat play? SO: While this game is not about fighting monsters, combat definitely plays a noticeable role. We want the player to feel the danger of the city, we want the player to be constantly aware of their surroundings. Different challenges arise from combat, like resource management. Also, we want to give the player ways to tackle each particular encounter, based on how many bullets they have, how strong the enemy is. Stealth or fleeing are valid and feasible options, you know. WP: How many different types of weapons will players have access to? SO: Quite a few. Revolvers, rifles, weapons, grenades etc. Weapons you’d expect to see in that period of time. At the same time, guns are not the only instruments we want to give you. There will be other tools for the player to use – like traps, for example. WP: Lovecraftian horror is often about fear of the unknown, helplessness and loss of sanity. How are you balancing these themes from a gameplay point of view, especially when it comes to combat? Will players be able to pick and choose their battles? SO: Yeah, as I said above, we absolutely want the player to make their own choices when it comes to virtually anything in the game, including combat. Engage, sneak past or run away – the choice is yours. Especially when you not only have to care about health or ammunition, but also the protagonist’s mental state. Insanity is one of the mechanics we use to reflect on Lovecraft’s fundamental psychological themes, and there are other ways we do it as well. WP: I read you’re looking to add a sanity (or insanity) aspect to the game. Can you tell us briefly how this will work or what ideas you have? SO: We have an insanity mechanic in the game, though we are still playing with it, trying to find the best way for it to work for the game and the player. Right now it works like that: when our main character witnesses something disturbing, he begins to gradually lose his sanity… Hallucinations, strange sounds – the hero is under a lot of stress. We are still looking at what kind of impact we want it to have on the character. WP: What sort of consequences will your choices have? Will they be permanent or will players get the chance to atone? WP: Will we see any RPG elements like skill upgrades or weapon upgrades at all? SO: Yeah, we are actually working on different sets of skills in the game, which should complement your primary gameplay mechanics like investigation, exploration or combat. These skills are supposed to make your life a tiny bit easier and more convenient. We are still fine-tuning these sets at the moment. WP: You’ve shown The Sinking City through a playable demo at a couple recent events. How has the public and critics responded to the early build of the game? SO: Not only we’ve received warm reception of the game, but players have also given us some very valuable feedback on certain moments in The Sinking City! Like camera angle, which is something we are tweaking based on people’s comments. Press coverage has been positive as well. People really like the game so far. And we are very grateful for their feedback! WP: How many different endings will the game feature? WP: You’ve stated that you will announce a release date when you’re ready. Is the target still 2018? SO: Excitingly, we announced a release date alongside our E3 2018 trailer. 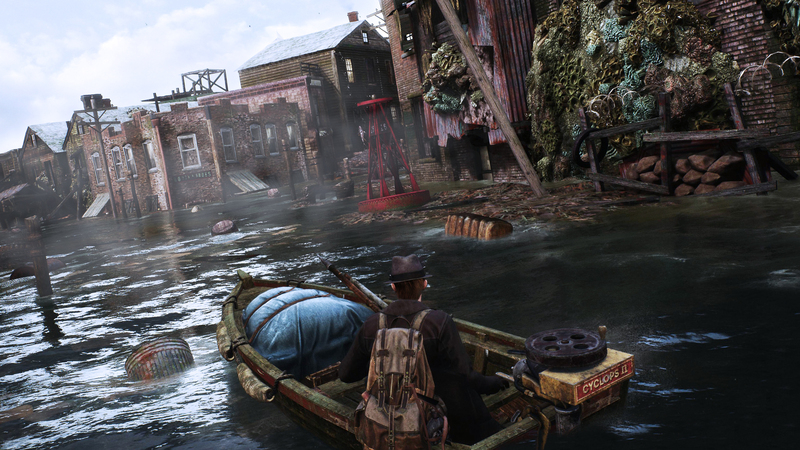 Players can explore The Sinking City as of March 21, 2019. WP: Both The Sinking City and Sherlock Holmes games are based on works of fiction. If you could use another author’s works as an inspiration who would you choose? Any titles in particular? WP: Thank you for your time. Looking forward to seeing what you have planned for E3. Good luck with the rest of the game’s development. The Sinking City will launch on March 21, 2019 for PC, PS4 and Xbox One. You can find out more information on the game’s official website.